MEMEBOX Free From Oil & Trouble Box + GIVEAWAY! You are here: Home › Beauty › MEMEBOX Free From Oil & Trouble Box + GIVEAWAY! 2 of 2 new unboxings and giveaways for Memebox Korean Products! The packaging and details of the information card show how much care and quality this company puts into their products! Korean beauty products have been highly recommended by so many friends of mine and these beauty boxes offer an inexpensive way to test and try different skincare, hair care and beauty products directly from well known brands in Korea. The value of the boxes outweighs the cost of the box itself and most times you will get 1 or several FULL SIZE products. Just watch the video to see how incredible their deluxe samples are and you will be wowed! Let me know if you try this out or if you have any products that you can recommend for me to try from their website! You can order and pre-order different editions of Memebox now! Valid date : July 1st ~ end of July, limit to one time per customer. Sign up for Memebox here. 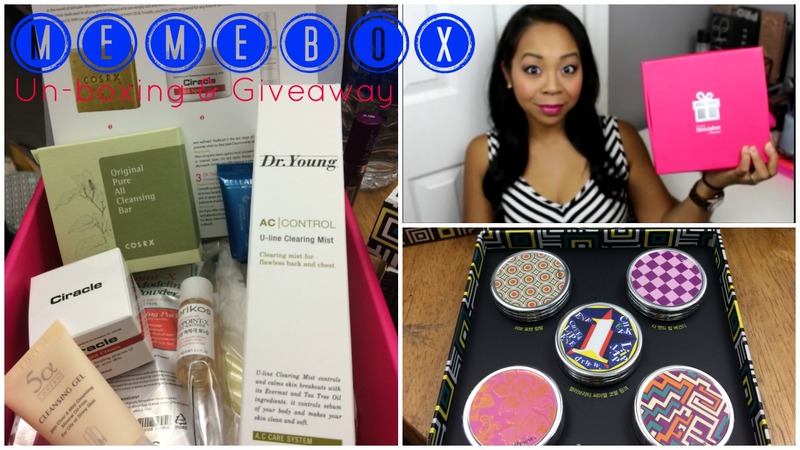 34 Responses to "MEMEBOX Free From Oil & Trouble Box + GIVEAWAY!" I have not tried any Korean beauty products. I need too! I’ve been watching Meme open boxes and they all look amazing! I would love to win, but if I don’t I just might have to subscribe! Thank you! Enjoyed your review & video, I’m amazed! I love Memebox. It’s so addicting. If I had a ridiculous amount of money I would buy them all. I highly recommend Aloe 92%, and Etude House’s hand creams! I have, and they’re all amazing! All so different and unique, I feel like I can trust Korean products, because they actually work (the ones I’ve tried have). as i have said.. i have’t tried any korean cosmetic product and i want to try one. I’ve only tried Skinfood brand. It was okay, not very impressed. I have tried many good products from Memebox. Several korean lip tints that I have tried are good. I haven’t but I really want too! I haven’t try ay Korean products and I want to try one. I Would love to try some Korean products! Thank you for the giveaway! Sadly, I haven’t tried any korean beauty products but I have heard great things about them. If I win this box it will be mu first time trying them! Straight out I Love Memebox. I even bought one for my boyfriend and he enjoys using the products. My favorite boxes are the hair and body 1 and 2. I tried the nail treatment and hair treatment. They work very well. Memebox is soo addicting and it’s hard not to buy. The items are worth every penny. Yes, i’ve tried korean bb creams, and Missha and Skin79 are my favorites ! I recommend any fermented cosmetics. It’s wonderful for your skin. I have never try Korean product. I would love to try that!! !